In this paper, we explore the capabilities of an algorithm for ice type classification. Our main motivation and exemplary application was the recent incident of the research vessel Akademik Shokalskiy, which was trapped in pack ice for about two weeks. Strong winds had driven ice floes into a bay, forming an area of pack ice, blocking the ship's advancement. High-resolution satellite images helped to assess the ice conditions at the location. To extract relevant information automatically from the images, we apply an algorithm that is aimed to generate an ice chart, outlining the different ice type zones such as pack ice, fast ice, open water. 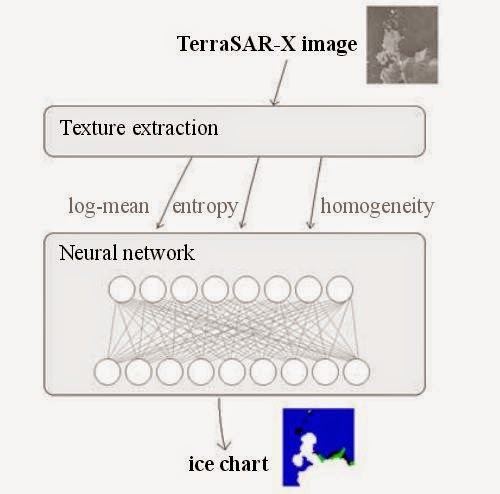 The algorithm is based on texture analysis. Textures are selected that allow recognition of different structures in ice. Subsequently, a neural network performs the classification. Since results are output in near real time, the algorithm offers new opportunities for ship routing in ice infested areas. For the artificial neural network, we rely on the popular and well-tested FANN library . We use 10 input neurons, two hidden layers with 8 and 9 neurons, respectively. Training procedure is RPROP. The number of output neurons depends on the number of classes. 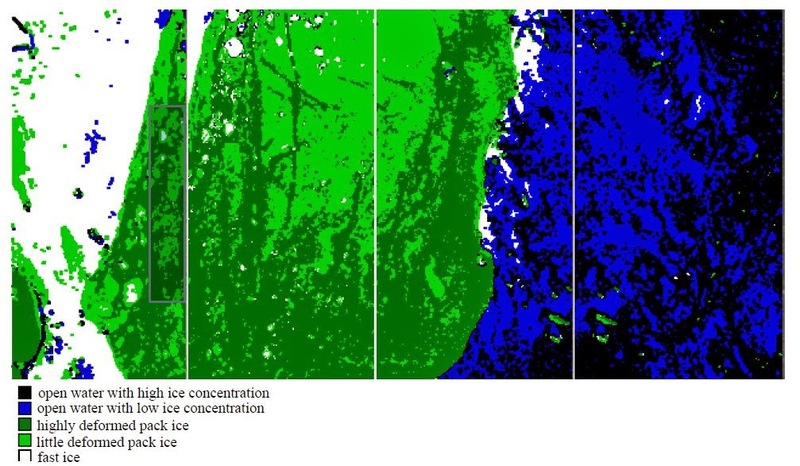 For the scene presented in this paper, we use neurons for each of the following ice types: fast ice, highly deformed pack ice, little deformed pack ice, and open water with high as well as low ice concentration. Land ice was visible in the scene yet was not used in the classification, since it is irrelevant once land masking is applied. FANN output is shown in Figure 6. As can be seen, it coincides well with the real ice conditions noted in Figure 2. Only small parts of the images are misclassified: The left margin of the open water zone is classified as fast ice. The fast ice zone is speckled with “ponds” of open water and pack ice in FANN output.